As an architect and endurance athlete, I’ve been interested for a long while in how the environment can be designed to foster fitness. I’ve designed a few projects around this theme and my approach to “fitness architecture” is unconventional from that of both perspectives, however, I believe that this kind of thinking can be of great benefit to those seeking greater options for fitness in their lives. Top fitness begins with a good understanding of one’s context. 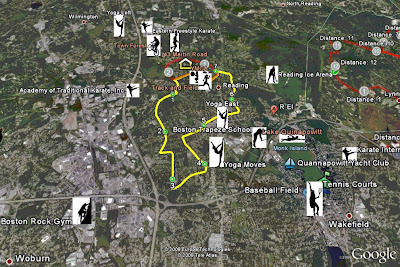 Simply put, ‘what are your fitness options?’ I’ve mapped my options for the last three places I’ve lived. It has helped me to think of my context as a campus of training opportunities. To do this, I start with the obvious amenities such as health clubs, yoga studios, martial arts clubs and so on. Some of these I may never use but it’s nice to know that they are available to me. Next, I map the less obvious, such as parks with running or biking trails, football fields with running tracks and bleachers, open water (and indoor pools) areas that could be used for swimming, paddling or kayaking. Additionally, I create my own running and riding routes of different distances. I find the steepest hills for resistance training, playgrounds with jungle gyms, open spaces for boot camp style workouts, beaches for running in sand. My only limitation is my imagination. 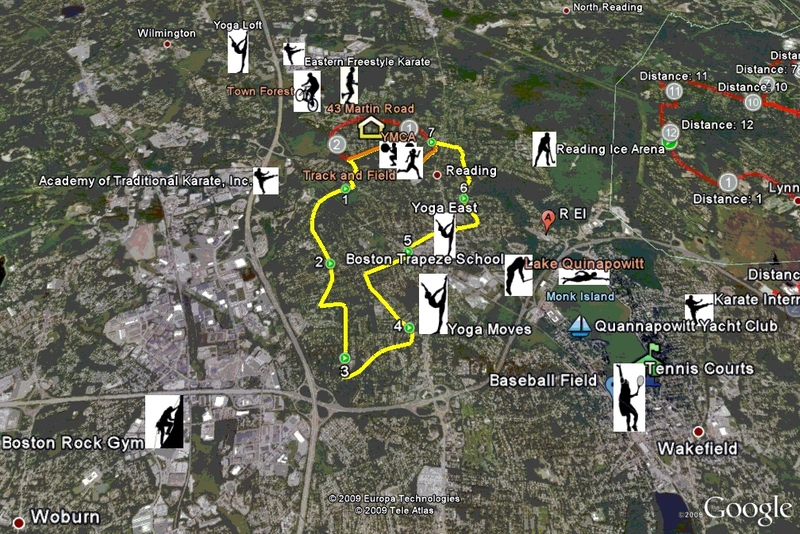 At the end of this exercise, I have a map of my neighborhood that shows a myriad of exercise options. This analysis has led to some interesting results. For example, I discovered that I could kayak from my house to the grocery store instead of drive. I also completed a Swim-Run workout by swimming to Marblehead (from the end of Derby pier in Salem) and running back. Last winter I created five specific terrain workouts that I did with my friends and we had a blast working out on the beach, the playground, on the bleachers, and on a steep grassy hill at Lynch Park. Each Terrain Workout was different and inspired by the context in which we live. If you look at your world in this way, you too will find that your context will call you to play. Once we’ve identified all of the great fitness opportunities available to us outside of the home (or office) we need to get organized in our homes. “Circuits” are a pathway to organize our equipment so that we can spend more time doing and less time preparing. To get started, I break my prep into a series of steps and create a pathway in my home along which I organize my gear. Each sport or activity may have a different circuit and some circuits will overlap. Running for example is a pretty simple circuit (since there’s not a lot of equipment involved). My run circuit consists of three storage areas. First, my clothing storage and changing area is for workout clothing only and in a place (my living room) where I can quickly change to run. I have a built in weather station here that allows me to dress appropriately for outside temperatures. Next, in the kitchen, I have a sport nutrition cabinet that holds all of my water bottles, my fuel belt, and supplements that may be required for a long run or ride. My last stop is my ‘electronics’ area where I keep my iPod, and heart rate monitor (and phone) – also a charging station. If I owned a GPS or power meter device I would keep it here too. I follow this pathway out (and back in) to be efficient when transitioning to run. By organizing my home in this way I’ve aided my ability to transition quickly to activity, thus spending more time in motion. We can easily bring exercise into the home by matching the spatial requirements of specific exercises with their appropriate places in the home. A few weeks ago I took a big tumble on my skate board. As I was hitting the pavement, I literally had the thought, ‘I need to develop more upper body strength!’ And so I began to incorporate pushups into my every day routine. In the space of my kitchen, I do two sets of pushups daily. The first is to warm up, a slow set and sometimes from my knees. The second set, immediately following, is to fail (as many as I can). In the first three weeks, I tripled my strength and reminded myself (yet again) that we can increase strength (and flexibility) with relatively little time. Another great anecdote for incorporating exercise into our daily routine occurred to me on a recent visit to a client’s home. I noticed a pull-up bar in the foyer hallway and we began discussing how the entire family uses it. The previous year, their oldest son took a standard fitness test at his school. By all standards he is a fit kid, in fact, he’s a black belt in Karate, but at the time he could only do one pull-up. Being a bit embar¬rassed by this, he convinced his parents to buy a pull up bar. “He can’t walk by it without doing a pull up,” they told me. After a year of doing pull-ups “he completed 11 pull-ups, the most pull-ups of his class, and was the only 5th grader to go all the way up the pegboard, across the top and back down the other side.” Now the whole family uses the bar and benefits from its placement in the home. Because of its location and visibility the bar became an integral part of the family’s day to day routine and all of this increased strength came from one very simple intervention. The stand-up workstation is another great example of how we can modify our environments to improve our well-being. Standing up at times when you might normally be sitting for long periods is becoming more en vogue. I’ve been standing while at work for a long time now and I’m a huge believer in the benefits of getting up off your…well, chair. But don’t take my word for it, do a quick Google search on "standing up while working.” You’ll see quickly what I mean. You too will want to free your gluts and hamstrings form the atrophy of being crushed all day long, every day, for years on end.These ‘exercise’ examples have real spatial requirements that we can use to incorporate into our homes (i.e. fit them in like a puzzle piece). So, for example, my kitchen has a nice open floor area for pushups, I’ve installed a pull up bar in my office and of course, do much of my work standing (with a raised desk). Each of these elements and spaces are triggers for these specific exercises and I’m now in the habit of using them frequently, without much forethought. The image below illustrates how our sport can be an artful and decorative addition to our home. 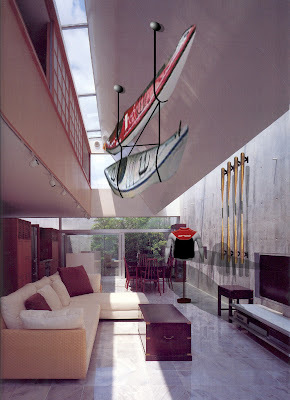 In this case, a Kayaker hangs his boats in a vaulted ceiling space. The paddles are arranged vertically on the wall and a PFD is displayed as sculpture. In my house, I display my bicycles on a special frame designed with lighting that illuminates the bikes in an artistic way and projects their silhouette onto the adjoining walls. It’s visually appealing and solves a huge storage dilemma. Having the bikes in view also inspires me to ride, even if it’s on the trainer in winter time. I hope that these ideas will inspire you to take a look at your environment and rethink your own fitness opportunities. I believe that fitness and FitSpace is always a ‘work in progress’ and requires evolution to remain meaningful and sustaining.